Leslie Low might be giving Humpback Oak a break but he is not idling. He has formed The Observatory together with Vivan (keyboards, vocals); Dharma (guitar) and Evan (laptop and assorted instruments) and the group has released a demo CD, Time Of Rebirth. While Low is known for his earnest, down-to-earth lyrics; with The Observatory, he has added an extra dimension - electronically-generated sounds. And, as IVAN THOMASZ says, it is certainly a Time Of Rebirth in more ways than one. Leslie Low... picture by Fadila. Listening to Time Of Rebirth, one gets the idea that The Observatory is so-called because it offers us observations on life and relationships. The album is an exploration into the nature of life and how it is tied to or limited by time, set against an electro-acoustic dreamscape of sounds. It is appropriate then, that the album opens with Hows Life. Singer-songwriter Leslie Low expands and transforms this trite casual greeting between acquaintances into a philosophical examination of how the individual regards life: "Life is slow/Oh do we know that its meant to be?" and "Do we ever grow up?" Hows Life forces the listener to take some time out to make a serious reflection on what life really means and how he or she lives it. The next song, Killing Time, has a related message. Sung by Vivian Wang in a coolly detached and understated elegiac tone, its about how we use or abuse (that is, "kill") the time given us. It laments: "Sad is the man with an empty life." The transient nature of earthly life is also pondered upon in Another Passerby. In this song, Low sings about people "coming and going" through his life, passing him by. It also hints at a failed relationship: "Heavy cloud hovers by/Its been a year of giving and forgiving." As time, life and people flow past him, he seems to remain stranded and declares, rather matter-of-factly, without any trace of self-pity: "Of all the things to do these days/I cannot find the meaning." The individuals search for transcendence or meaning in life seems to be a major pre-occupation for Low. This is borne out in Hearts And Souls, where he asks, "Can we ever know the meaning of our hearts and our souls?" and also, "What are we missing again?" On the title track, he also offers, "When will we learn to admit defeat?/Time understands when it wants to," probably as an acknowledgement of the futility in trying to attain a perfect understanding of life on our own finite terms. 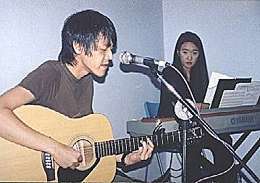 To complement the generally melancholic and introspective mood of the lyrics, the musical accompaniment for the songs is an ambitious blend of acoustic and electronic instruments that are mostly played at a down-tempo pace, with fetching yet subdued jazzy melodies - for example, the track Ask. In addition, the volume of performance is also deliberately kept from hitting the upper range of the decibel scale, thereby creating a mellow, dreamy quality that permeates the entire album. On the whole, the bands attempt to achieve a harmonious fusion between acoustic and electronic sounds is largely viable. On Killing Time, intriguing electronically-generated sound effects are subtly employed in the background to imbue the song with an atmosphere of other-worldliness. Time Of Rebirth is a timely way-station on the journey of life. It is a much-needed transitory point in time and space to take stock of ones past experiences and present circumstances before embarking on a new leg of this pilgrimage whose final destination is always hidden from us. And, given the current bleak condition of the world, it could not have come at a better time. Note: The Observatory can be contacted at theobservatory2001@yahoo.com.sg. If The Observatory's Evan Tan is a familiar face, that's because Tan was once upon a time a member of Opposition Party and the Padres. 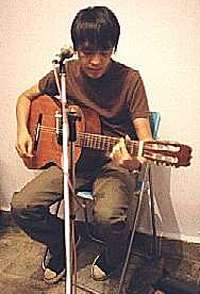 Recently, on his own, he has performed in the Strategies series of concerts. CLICK HERE to find out more about this series of electronic avant garde performances, co-ordinated by George Chua. Review of Strategies v.01 by Ivan Thomasz.